Next, you'll add more elements to your poster, but you'll work with these elements on different layers. Throughout this lesson, you'll create new layers so you can draw, edit, paste, and reposition elements on one layer without disturbing other layers. Before you begin, make sure that the Shape 1 layer is still selected in the Layers palette. 1 In the Layers palette, click the New Layer button (j) at the bottom of the palette to create a new layer. A new layer, named Layer 1, appears above the Shape 1 layer in the Layers palette and is automatically selected. 2 Select the ellipse tool ( ), which is currently hidden under the polygon tool (ft). 3 In the tool options bar, select the Paths option (1$). 4 Start dragging the ellipse tool in the upper left area of the poster and then hold down Shift as you continue dragging. Release the mouse button when the circle is close to the bottom edge of the blue shape. 5 In the tool options bar, select the Exclude Overlapping Path Areas option (^j). 6 Hold down Shift and draw a second circle within the first. • To resize a circle, select it with the path selection tool and choose Edit > Free Transform Path; then hold down Shift and drag a corner handle to resize the circle without distorting its shape. When you finish, press Enter to apply the transformation. Note: In the Paths palette, only the new Work Path appears at this time. The Shape 1 Vector Mask that you created earlier (the blue shape with star cutouts) is associated with the Shape 1 layer. Since you are not working on the Shape 1 layer now, that vector mask does not appear in the Paths palette. When you draw a shape in Photoshop, the shape is actually a vector mask that defines the areas in which the foreground color appears. That's why you see two thumbnails in the Layers palette for each shape layer: one for the layer color and a second one for the shape itself (as defined by the layer mask). 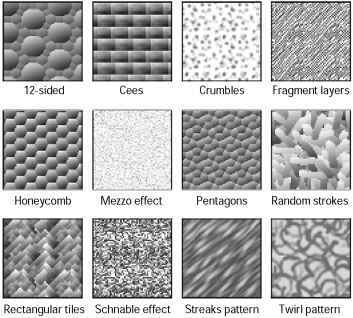 A work path is sort of a shape-for-hire: It stands at the ready, independent of any but available to serve as the basis of a vector mask on a layer. You can use the work path repeatedly to apply it to several different layers. This concept differs from the approach used by many popular vector-graphics applications, such as Adobe Illustrator, so if you are used to working in that kind of program, this may take some getting used to. It may help you understand this if you bear in mind that the underlying metaphor behind Photoshop is traditional photography, where the admission of light into a camera lens determines the shapes, colors, and transparencies of the negative, and then darkroom exposure determines what areas of the photographic paper develop into areas of color or darkness and light. The Paths palette displays only two types of paths. The first type includes any vector paths associated with the currently selected Layer. The other type is the Work Path—if one exists—because it is available to be applied to any layer. Because a vector path is automatically linked to a layer when you create it, transforming either the layer or the vector path (such as by resizing or distortion), causes both the layer and the vector path to change. Unlike a vector path, a work path is not tied to any specific layer, so it appears in the Paths palette regardless of which layer is currently selected. 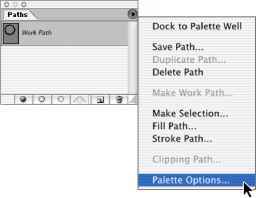 In the Paths palette, the thumbnail shows the two subpaths with a white area between them.